I love bows!! I once made cupcakes with lil bow candy on top. 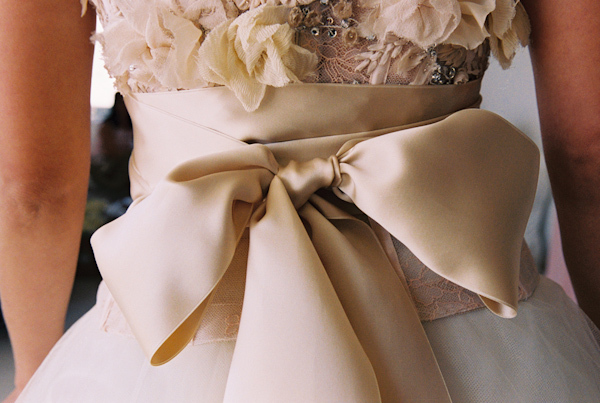 This bow on the dress is beautiful! That is a beautiful shade... darker than cream, lighter than taupe... very pretty. How grand and there truly is nothing more beautiful than a bow in the hair, back of bridal dresses, child's dresses, and at the shoulder on evening and sundresses...stunning. Divine indeed - I just love it!! ah! I had a bow just like that on my lace wedding dress :) we called it "champagne"
Yes that color is incredible and that bow well is just pure perfection. Divine colour, as is the way the fabric just flows as if it is melting vanilla icecream....gorgeousness! Awh it's gorgeous, love the contrasts. I love bows!! Wish I could have a dress with a bow like that at the back =P. Pretty!